What is it with Cabo? First we could not get there fast enough, so the Captain could take on another job and then, it would not let us go again. We tried several times. Twice we were all ready to go, thought we had the motor fixed, and twice the motor failed on us. Each time it caused a couple days delay, as it was always right in time for the weekend with no mechanics in sight. And now the weather doesn’t play well, which made things quite difficult for everyone in the anchorage. It started with swell followed by strong winds and being on the boat felt like being inside a washing machine. The constant rolling and up and down made Mats and myself feel motion sick. After a night of no sleep, the Captain packed us up, drove us to shore with the dinghy for an egg breakfast and found a great hotel right by the Marina. And he did that right in time as things got worse. Here a little clip when things were a little bit more mellow again, to give you and idea. His attempt going back to Alsager almost ended in a disaster and us losing our dinghy. When he tried getting into the channel, a big wave threw the bow upwards and water rushed over the stern into the dinghy. The Captain had to throw himself forward to prevent the dinghy from swamping. He shuffled the water out as best as possible and made a second attempt. He made it to Alsager and while the waves threw the dinghy against the side of the boat, he tried to hold on and find a moment to get onto our sailing vessel. 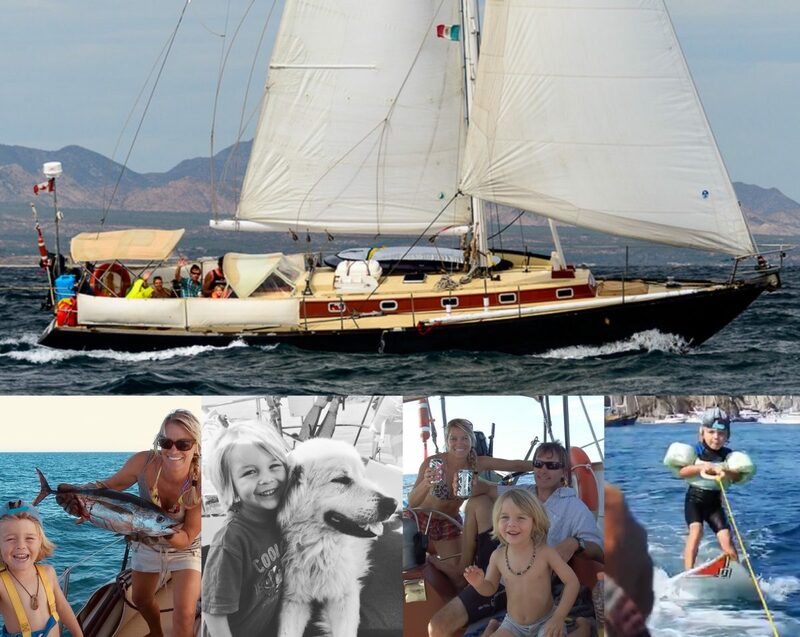 I wasn’t there, but we have done it with a kid and dog on board and even when the situation is not so intense, it is always a moment of adrenaline rush to get everyone from one boat to the other safely. So, very glad he made it ok! He noticed, that boats around him had all kind of problems, but since he was by himself, he had to attend to the safety of ours first. He immediately started the motor to make sure, he could hold Alsager in place, in case the Anchor would start dragging. Than he got a second anchor out and with the help of a nice neighbor, who assisted in his dinghy, they were able to set a second anchor. Previous Previous post: Todos Santos and the famous Hotel California!